On Friday, May 17 beginning at 7:00 pm at Survival Kit Gallery, located on the 3rd floor of 78th Street Studios in the Gordon Square Arts District, Ars Futura — Shuai Wang and Hyunsoo Kim, piano, Madeline Lucas, flute, Jinjoo Cho, violin and Carlos Javier, cello — present the final performance of the group’s inaugural season. The concert features the music of Keith Fitch, Marshall Griffith, Eric Charnofsky, Tim Mauthe and Joseph Hallman. (Pictured above: Wang and Hallman). 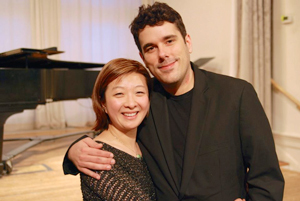 Shuai Wang and Madeline Lucas decided to form the group after working together in other area new music ensembles such as Five-One Experimental Orchestra, Blue Streak Ensemble and a Morton Feldman project at MOCA. “We work well together and thought it would be great to form a group dedicated to newly-written works,” says Wang. Four Characters, a new sonata for flute and piano by Eric Charnofsky, was commissioned as a result of Charnofsky’s being named the 2012 Ohio Music Teachers Association Composer of the Year. “It has been performed a couple of times in the area but it’s a really great piece and I’m very excited to be able to play it,” Lucas adds. Now that Ars Futura’s inaugural season is almost over, what are Shuai Wang’s and Madeline Lucas’s hopes for the future? They both agree that although this was a first-year trial run, every experience has been fantastic and the group has been well received by audiences. So presenting more concerts locally is a goal and the group has plans to return to Philly. Whatever the future does hold, Wang and Lucas agree that working with young people is a priority and exposing younger kids to the world of sound is a must. Following the concert, audiences are invited to stay and have a drink with the musicians and composers as the group is eager to connect with everyone and to share their vision and plans for next season.